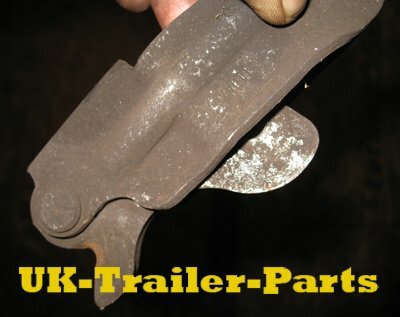 Here is a step by step guide to replacing brake shoes. Lift the trailer off of the ground and onto stands so that all of the wheels can turn freely. Make sure the handbrake is locked in the ‘off’ position. Now you can begin by removing the wheels and the hub caps. Slacken off the brake adjuster until it becomes loose, do not remove it. On some brakes this adjuster is a bolt on the back plate of the brake, others have a ratchet type adjuster inside the brake drum. To reach this you will have to use a screwdriver to turn the ratchet through a small hole in the back plate of the brake. This may be concealed behind a plastic stud. Remove the axle nut. This could be a simple locknut, or it could be a castle nut secured by a split pin. Next remove the brake drum by turning it left and right while pulling away from the back plate. 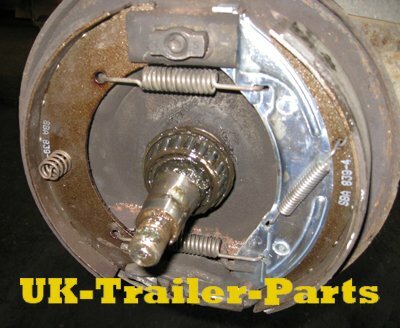 Make sure you do not disturb the bearings or brake shoes at this stage. It is also important to note that brake dust is harmful if inhaled, so be careful not to inhale any while removing the drum. If you have a buildup of brake dust, the best way to remove it is to wipe it away with a cloth. Now the drum is free from the trailer, check its condition. The drum should be replaced if there are deep score marks around the inside. The next step is to remove the brake cables. For a detailed guide on brake cable replacement please see here. Using screwdriver as a lever, carefully lift the sliding end of the shoe away from the expander. 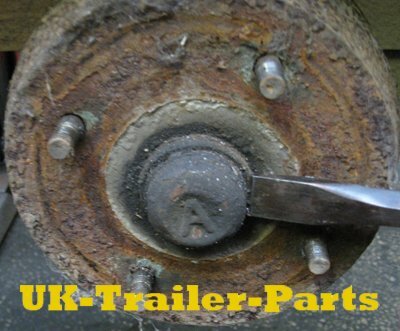 Once the top of the brake shoes are out of the expander you should be able to remove the expander and top brake shoe retaining spring. The whole brake shoe assembly should now be lifted away from the back plate. Be careful not to lose the two small adjuster wedges that may drop out during this process. Now check all of the brakes components including springs and the adjuster. Clean the entire mechanism, making sure everything is free to move and undamaged. Any damaged or rusty parts should be replaced. Avoid any kind of lubricant or penetrating oil as this could prevent your brakes from working. The expander is a very important part of the brake unit and it has to remain free of rust in order for it to work properly. You can check that the expander is working correctly by simply holding it by the hinge. It should swing open freely. If it does not, rust will be preventing it and it should be replaced immediately. Re-fit the lower spring to the new brake shoes and re-position the new brake shoe assembly back onto the back plate. Remember to re-attach the assembly to the adjuster wedges, or cam block if you have brakes with a ratchet style adjuster. Return the top retaining spring and re-fit the expander between the two brake shoes. You may need to carefully use a lever like when it was removed in order to do this. You can now re-attach the brake cables and cover plate. If your cables are showing any signs of wear or corrosion they should be replaced for new ones at this time. 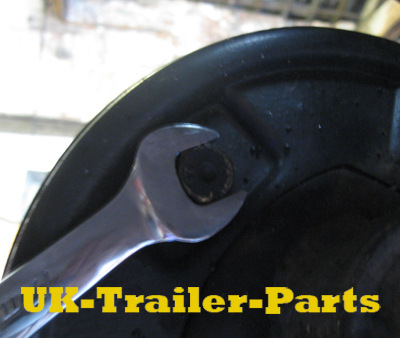 Re-fit the brake drum and bearings and secure them in place with the axle nut. 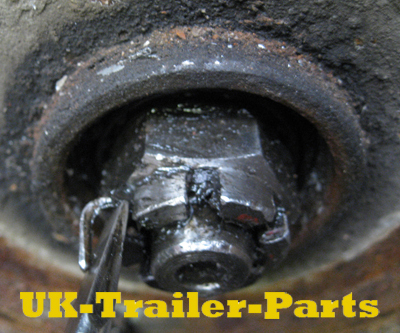 For tips on how to do this, see this guide on replacing trailer wheel bearings here. Replace the hub cap and wheels before moving on to adjusting the brakes. 1. 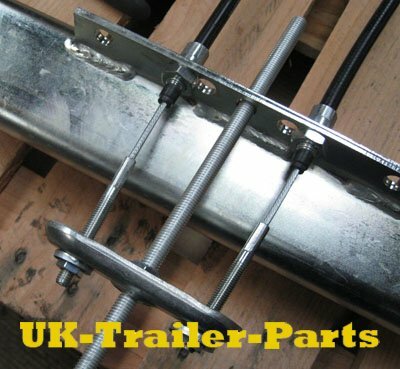 The trailers drawbar must remain fully extended. Adjusting the brakes while the drawbar is even slightly compressed will result in the brakes becoming incorrectly adjusted when the drawbar becomes extended during use. 2. 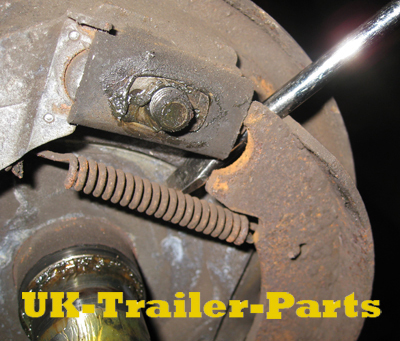 When adjusting your brakes only rotate the trailer wheels in the forward direction. 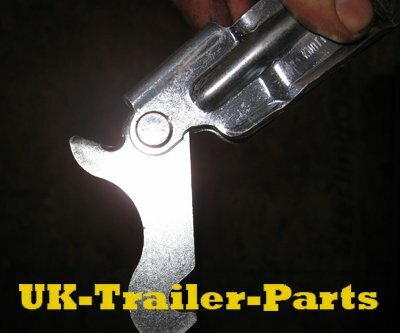 This is because most trailer brakes will lock when turned in reverse. This is because of an auto reverse mechanism. To adjust trailer brakes you have to rotate the wheels in the forward direction. Now tighten the adjuster (either a nut or ratchet adjuster) until you can just feel the brakes start to bind. When you can feel this resistance carefully turn the adjuster back until the wheel can just rotate freely. Now adjust the nut on the brake rod until it makes contact with the compensator. Be sure not to over tighten this as it will slowly apply the brakes, causing them to bind and overheat. Turning each wheel backwards with the handbrake engaged will cause the brakes to lock after a short time. If they do not lock, there is too much slack in the cables and they will need further adjustment. Well adjusted brakes should leave the brake compensator at 90˚ to the brake rod, and parallel to the brake cable anchor point. As shown below. Finally, check all components have been correctly installed and all wheel nuts are tight. 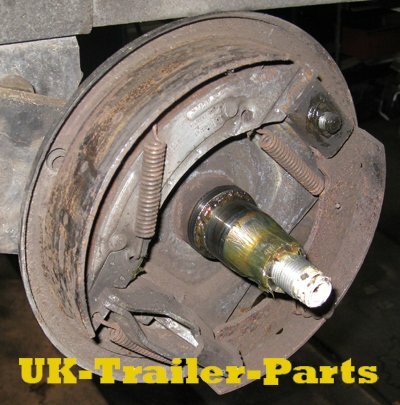 Remember that new brake shoes take a while to bed in and brake adjustments should be re-checked after a short journey.